Late post today. Had a busy weekend preparing and attending the Library’s Fundraising Gala. It was a lot of work, but fun to decorate, and was worth it. It was a beautiful event, and many of the guests hinted at what it would be like next year. My daughter and I made ourselves all fancy and had a nice time. See the pics below. Still reading The Mistletoe Inn by Richard Paul Evans. I am about half way through it, but didn’t get much reading time this weekend. It is really good so far, I like when I can’t figure out a character. Hope to finish it tonight. Next to Roshky, this is my next favorite Christmas cookie. Add sifted flour and nuts and blend well. Chill dough. Remove foil from kisses. Shape dough around kisses, using about 1T dough. Roll into ball. Be sure to cover kiss completely. Cool slightly, then remove to wire racks. While still a little warm, roll in confectioner’s sugar. Makes about 2 dozen cookies. I sprinkle more powder sugar on them when I put them on a serving tray. I am planning on doing some baking this week. We had a lot of leftover goodies from the Gala. My son is a busser at a local restaurant, and they had a holiday party over the weekend, he brought home some kind of cake from that. Then my neighbor gave us a tray full of cupcakes from one of their Christmas events. Never thought I’d ever say it, but that’s a lot of sweets 🙂 Looks like I’ll be baking at the end of the week, if I’m not in a sugar coma. This Saturday, the town will have over a dozen ice sculptors on the main street. Also, the reindeer will be back with their trainer, where you can take pictures with them. OMG the reindeer!! They were in the parade on Friday, and the one was so adorable!! It’s like he had a personality, his face was just too adorable!! I found this video a couple of years ago, and I don’t know how. Probably looking for the Pentatonix rendition of Little Drummer boy, which is really good. This is an added twist. This guy is a drummer, and he does videos just drumming to various songs. This is the behind the scenes video which I thought was so much fun to watch, just to see what these guys did to make this video. The actual video plays in the upper left hand corner, but you can watch it here. I have always enjoyed watching drummers (my brother is one) because they always seem to have so much fun. Awesome drumming!! 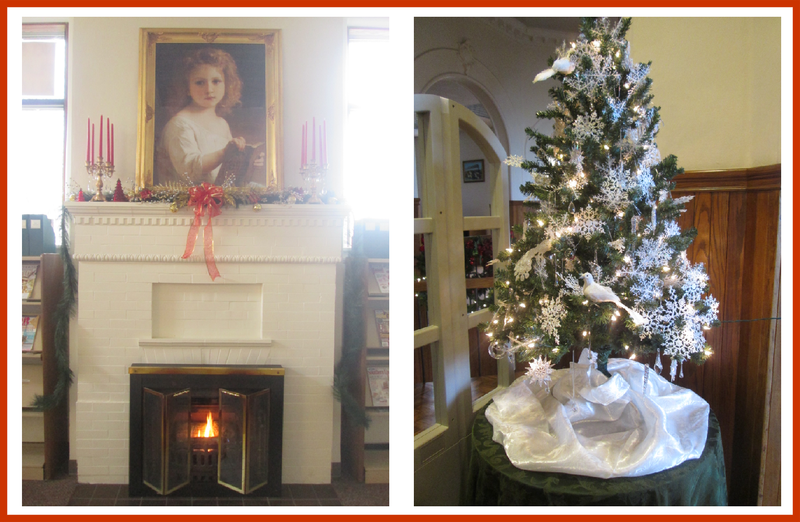 Decorations…There are two fire places in the library, this is one of them. All these decorations were brought in and put up by one of the residents, he also works for the city. These are the front cases that are in the entryway. My mom, daughter and I decorated these. The wooden sleigh is my mom’s. Her dad made it in the summer of 1958. He made one for each of his kids, which has been a treasured keepsake for them, since he passed away the day after Christmas that same year. I really like Ariana Grande. This is my get-up-and-go Christmas song 🙂 My daughter has been singing this one around the house, you’ll be singing it too once you listen. 18 More sleeps until Christmas!! You’re library is gorgeous! What fun photos and you Gals did a great job on the display windows!! I always love the drums too. And I used to think I wanted to be a drummer – way back when I played flute as a youngin’. I don’t think my folks wanted to encourage that though. Lol 🙂 I’ll have to check out that video. Your activities sound so fun – ice sculptures and reindeer on parade! Lol Sounds so fun!!! My brothers had several bands during their high school years, I don’t know how my parent’s put up with them, but they did 🙂 Our weather this weekend will be in the 60’s so the ice sculptors have been postponed. You know I’m wishing for snow soon!! Where do you get all of these amazing cookie recipes? I am so jealous! That gala looked like so much fun, everything was so beautiful!